A unique, 80 year old Laguna writer's home, still owned by original family. The house is three bedrooms, two baths, set on a half acre of wooded hillside, six blocks from the beach, one mile south of downtown Laguna Beach, near BlueBird Canyon. 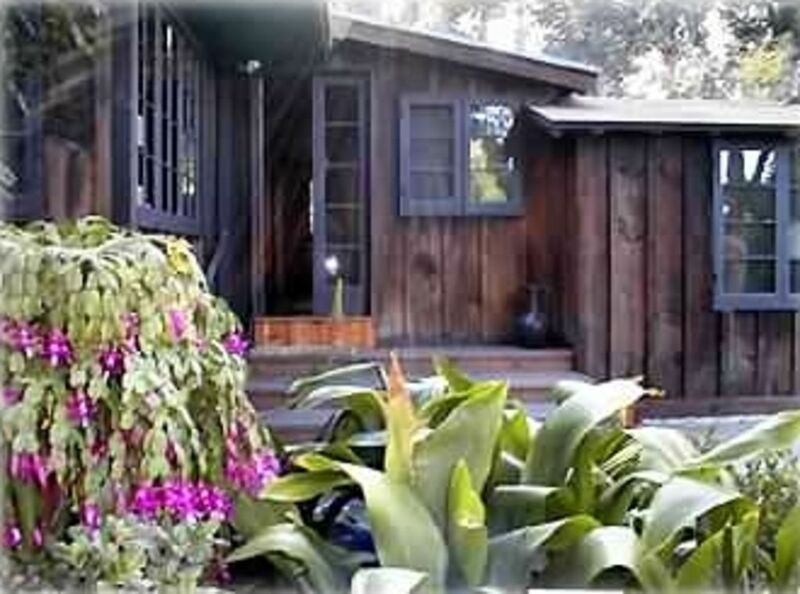 One of Laguna's early homes, built simply with pine walls and floors, the house has a good-sized living and dining room with a wonderful fireplace. Soaring eucalyptus trees planted around the perimeter of the property in the 1920s host a variety birds and migrating monarch butterflies. The natural, spacious landscape encourages the play of children. change of scene as tides work their way in and out. Perfect as an artist or family retreat. My family and I loved everything about this quaint Laguna cottage. The home had everything one needs for a comfortable getaway and the beautiful location nestled in the lush green canyon was like it was out of a fairy tale. We walked to Bluebird Canyon Park and the beach every day. We would love to return. Perfect place to come see the ocean. House is an antique and full of history. Beautiful cottage as described! Very cozy, with lots of firewood on the premises, extra blankets, and a giant shower/bath with excellent water pressure. The kitchen is also well stocked to do some actual cooking, which is of course not always the case. If there was a coffee grinder, I missed it. That would be my only request to add to this tranquil and enchanting spot on the coast! This house and property are infused with magic. So so enchanting! Wire house is like stepping into a time machine. The bedrooms, kitchen and communal spaces were so charming and comfortable. With each creak of the beautiful wood floors, I felt like I was communing with those that lived and loved before me. My husband and I stayed for one night and I wish it could have been a month. The house has almost any modern convenience you might need (WiFi, nice fridge, microwave, hairdryer, great water pressure in the shower, etc) but you almost don’t care because you are reading one of their great books from the bookshelf, curled up in a sunny spot on one of the comfortable beds. And the lighting!! Truly this place is magic. I almost don’t want anyone to know how special this place is. Thank you Annette! We will most definitely be coming back. We shared this lovely cottage with another couple and found it was perfect for our needs. It is a few blocks up the hill from the beach with a view of the ocean and the sunset from the porch. Inside it is unique, having been built in the 1920's, and the furnishings were comfortable and the kitchen fully equipped. Annette was extremely responsive and we highly recommend this property. This is a unique, rustic cabin with a lot of history. It's in an ideal part of town and very secluded. We enjoyed our visit. Nightly rental only possible if still avaiable 1 month before the date desired. Change over day for weekly rentals is Saturday. Thanksgiving, Christmas and New Years weeks also charged at high season rates.